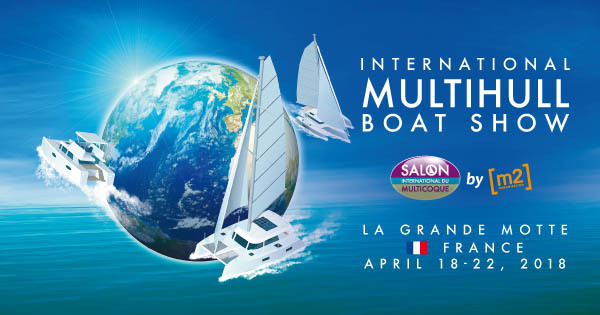 Balance Catamarans can be found all over the world, so what better way to continue our international representation than to attend the La Grand Motte Boat Show on April 24 -28, 2019! Phil Berman and Alexis de Boucaud will be present and on display at this exclusive and strictly-catamaran show in France. The Balance 526 has been the star of United States Sailboat Shows since her launch, turning heads and eliciting praise from all quarters of the industry. She’s a stunning high-performance catamaran that represents the exciting rebirth in South Africa of the high-end, labor-intensive, epoxy/ carbon build techniques first employed by Gunboat in Cape Town in the mid-2000s. Now, she is ready to do the same in Europe. In addition to being a yacht of the finest quality, the Balance 526 helm station design breaks significant new ground. The new ‘Versahelm’ design of the Balance 526 is so elegant, wise and functional one wonders why nobody thought to do it before on a catamaran. This helm station concept will surely be copied over and over again in the next generation of blue water catamarans. It makes it possible to sail in total comfort and protection no matter how nasty the weather gets, yet offers all the joys and pleasures of sailing when the weather is inviting. The initial inspiration for the Versahelm came from multihull racer, author, and yacht broker Phil Berman, owner of The Multihull Company. The fine points of the design were drafted in a close partnership with Cape Town naval architect Anton du Toit and esteemed South African catamaran builder Jonathan Paarman. To arrange a time to personally inspect the boats or schedule a time to speak with a balance associate, inquire here today!